I first came across Toshiya Kamei’s A Fox’s Window and Other Stories while performing a random Google search for “Awa Naoko translation.” I was surprised and excited to find this collection of Awa Naoko’s children’s stories, most of which are appearing in English for the first time. Awa (1943–1993) is a beloved children’s literature writer in Japan who received numerous literary prizes in her lifetime. Mostly unknown abroad, Awa has been compared to Beatrix Potter and Hans Christian Andersen as a writer of modern fairy tales. Her stories, usually set in an undefined era in rural Japan, intriguingly mix the everyday life and emotions of children with a magical world of nature that is both wonderful and frightening. In Awa’s world, animals, flowers, and trees speak, mountain and sea witches are a reality, and spells turn seagulls into children. Readers are compelled to rethink the complicated relationship between humans and nature as foxes, cranes, and magnolia trees indelibly touch humans’ lives with poignant moral lessons. Sweet and haunting, Awa’s stories delight both adults and children. Toshiya Kamei was born in Japan and studied English and Spanish in school. He received an M.F.A. in literary translation from the University of Arkansas, and his translations have appeared in literary journals and magazines, mainly in the United States. In addition to The Fox’s Window and Other Stories, he has translated from Spanish a collection of modern short stories by Liliana Blum entitled The Curse of Eve (Host Publications, Inc., 2008). 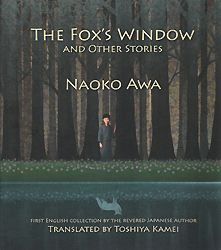 In the opening translator’s note to The Fox’s Window and Other Stories, Kamei writes that he selected thirty of his favorite Awa stories from childhood. The result is a wonderful collection that spans Awa’s three decade-long career, with classics such as “The Bird,” (Tori), “The Long Gray Skirt” (Nagai haiiro no sukāto), and “While the Beans Are Cooking” (Hanamame no nieru made). The translated collection is wonderful-looking, too, with a gorgeous cover illustration by Amane Kaneko and three black-and-white illustrations included in the text. I couldn’t help but wish, however, that the editors at UNO Press had handled this text more carefully, so that Awa’s stories could have been impeccably represented in more natural English. “The Long Gray Skirt” is a haunting tale in which a girl sees her younger brother kidnapped and turned into a pigeon by a woman in a gray skirt. Later the girl is told that her brother had drowned and everything she witnessed was merely a figment of her imagination, the result of spending a frightening night in the forest alone. Other instances of pronouns without antecedents, unclear tenses, and missing or incorrect articles and prepositions abruptly remind readers that they are reading translated text. On page 69 a definite article is used in front of bush although a bush has not yet been mentioned in the story (“As the path bent around the river, he disappeared behind the bush”), leaving the reader wondering, “What bush?” On page 72, はっときがついたとき is translated as “When I realized it,” without any antecedent for “it”: そして . . . はっと気がついたとき、ながい灰色のスカートのふもとにぺしゃんと、すわっていました becomes “When I realized it, I sat by the long gray skirt.” This sentence also illustrates the toll of tense confusion in Kamei’s translation. I’m not sure why すわっていました isn’t translated as “was sitting,” as this would make it clear as to whether the girl suddenly found herself sitting by the skirt or she intentionally sat down near it, upon realizing that she had been running for a long time. Something like “Suddenly I realized I was sitting right at the hem of the long gray skirt” might have worked better. Undoubtedly it is difficult to translate some of the conversational, story-telling qualities of Awa’s writing into smooth English. Kamei omits many conversational elements of the narration such as そしてandじゃありませんか. Of course it is not necessary to translate every word directly from Japanese into English, and sometimes Kamei simplifies masterfully. There are some places where Kamei’s renderings of Japanese expressions into English are impressive. For example, 胸が凍りました becomes “my heart froze with fear,” and（たべられる、たべられる）と、心にくりかえしながら smoothly becomes “‘I’m going to be eaten!’ I screamed inside my head” (p. 72). It is in lines like these, where Kamei boldly reconstructs Awa’s words in natural, believable English, that his translation shines. A final detractor in The Fox’s Window and Other Stories is awkward or incorrect English. In “The Large Magnolia” we read that “[Sayo] felt the pecking sound echo her body” (p. 221) when perhaps it should be that the sound echoed within her body. A few pages later, the sentence “Stared by a pair of green eyes, Sayo nodded” (p. 224) sounds like poorly translated English with its missing preposition. Without a doubt one of the charms of Awa’s writing is its storytelling quality. I understand, however, that much of it could be difficult to relay in English. In the original Japanese, characters’ thoughts are sometimes set off in parentheses, sometimes not, and at times the narration trails off in ellipses as the main character is left bewildered or questioning his/her own thoughts. Kamei was smart to wrap quotation marks neatly around characters’ thoughts, give them clear attributions, and omit trails of ellipsis points in parentheses that would be confusing in English. Lastly, it is not clear whether this book is intended for scholars, fans of Japanese literature in translation, or the average American child—and perhaps it doesn’t matter. But if this were a publication intended to introduce Awa’s stories to American children, I would wish it contained a simple glossary to explain Japanese terms. Currently Japanese words such as susuki, chanchanko, uchikake, and furisode are used in the text without adequate explanation. A glossary might make the book more child- and even classroom-friendly. Toshiya Kamei has nevertheless done a tremendous service in translating Awa’s stories and getting an entire collection published by the University of New Orleans Press. Hopefully The Fox’s Window and Other Stories will spark American readers’ interest in Awa’s writing and pave the way for more translations of her work to come.